20 Pound & 40 Pound Bags of Premium Cocktail Ice. Perfect for drink glasses or icing down food or soda cans in your favorite ice chest. 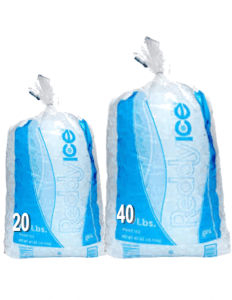 Manufactured by Reddy Ice with reverse osmosis purified water. This is the best ice in Texas. Vogt Tube ice size 1-1/8” diameter x 1” length. When your ice machine is not getting the job done, CALL 713-941-7733. Our trucks are loaded and waiting for your order. Courteous dispatchers and drivers will respond with a true sense of urgency to your need. 98% of our emergency deliveries are made within an hour. HOWEVER we do need to operate in a safe manner so weather, traffic and work load may make some orders over our 1 HOUR delivery goal. 400 lbs. to 20,000 lbs. – We Can Supply You with the Ice You Need-FAST! Our minimum orders begin at 400 pounds all the way up to 20,000 pounds. Distance is normally what determines the minimum. We are positive professionals and can supply you with as much ice as you need in a timely manner. Don’t forget that in an emergency you can always send someone to 8257 Gulf Freeway, Houston, Texas 77017 and we will load your ice and accept your previously established credit or cash and you won’t even have to get out of your car.